TheBunnieHole | Vancouver Youtuber & Blogger: Craft:: My Vintage Wardrobe Project has begun! Craft:: My Vintage Wardrobe Project has begun! I've always had a soft spot for "old things" (as my BF would call it) and while many people embrace the exhilaration of our high tech world, I'm often looking for ways to slow down and smell the flowers. I'd like to think that with all our modern advancements, it becomes increasingly easier to pursue our eclectic hobbies. Case and point, I recently grabbed two books from the library that perked up my interest in vintage (inspired) clothing and while I'm not really keen on scavenging ready made clothing pieces per say, I am all up for attempting a basic vintage wardrobe project. Now there are quite a few ways to get a hold of these out of print vintage items but being an Etsian, I thought I would start there (on Etsy) and see what gems I can dig up......and boy oh boy there's a whole lot to be found! Many sellers either source patterns from yard sales ("boot sales"), have them handed down from family members or may even acquire them from an estate or auction. I personally prefer new uncut patterns just so I know that they are a complete set and I can better take care of them later on. Perhaps it was the social mentality of the day or maybe it was by some other unexplainable magic of nature but gosh I can't help but be in awe of the glamour that is portrayed in these illustrations. Most of what I am looking for is that tight niche period between 1955 to 1965, when fashion embraced the voluptuous female form and dressing up was a crucial part of everyday life. Prior to that the shoulder pads of the 1940s were not my taste and after that the gamine look of the late 1960s certainly wouldn't have fit my body type. Even in modern fashions I tend to gravitate towards classic designers such as Oscar de la Renta and Valentino. One thing that I quickly embraced during my pattern search was the different outlook on silhouette, shape and tailoring. Even the most simple looking pieces had carefully placed darts and seams. Caplets, coats and small detailed accessories dressed up an otherwise standard set of form fitting skirts and sheaths. I own a few pieces with similar designs and I must admit they even change the way you move and walk. A little extra swing in your hips is essential to taking a step in that wiggle skirt! If you are either petite or extra tall, I'm sure you've encountered those moments in the dressing room where your dreams of the fabulous outfit was dashed because it was just a little bit off. Proportion is essential to a good fit and while some people may have a tailor's number on speed dial I am more inclined to just find something good the first time. 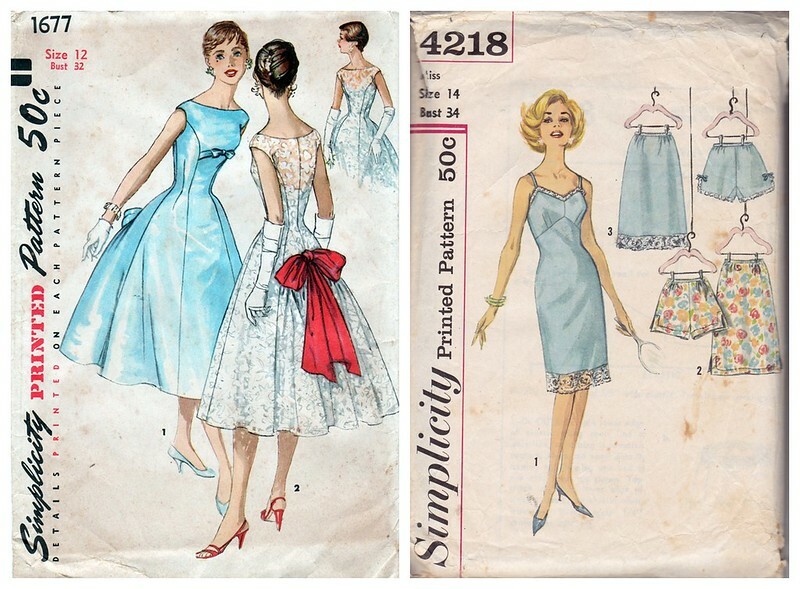 With a little extra digging and some key search words like "proportioned sizes" you can find vintage patterns with special sizing adjustments to suit your height. I really wish modern pattern makers would bring this back! 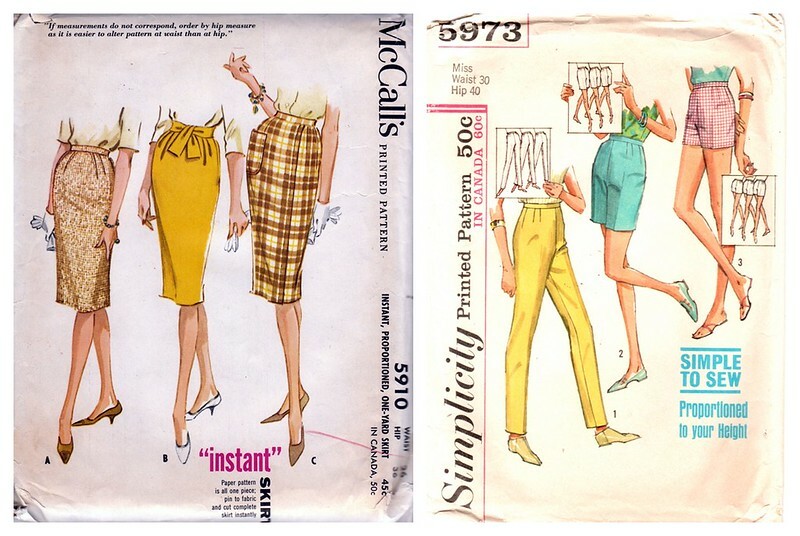 Note: Vintage pattern sizing systems (bust, waist, hip) vary between time periods and are often different from modern sizes so take extra care to check the envelope measurements to make sure you're getting the best possible fit. And for those who feel the vintage look is old and boring, I actually found some neat little designs and details that would fit right along modern day couture looks. That peplum trend that's been hot for months now? See this 1940s take on detachable peplums! Need some extra drama to your even dress? How about a lace overdress to go with it? There was a strong focus on versatility during these times and accessorizing basic pieces so that the same outfit may be worn a few times a week without looking drab. 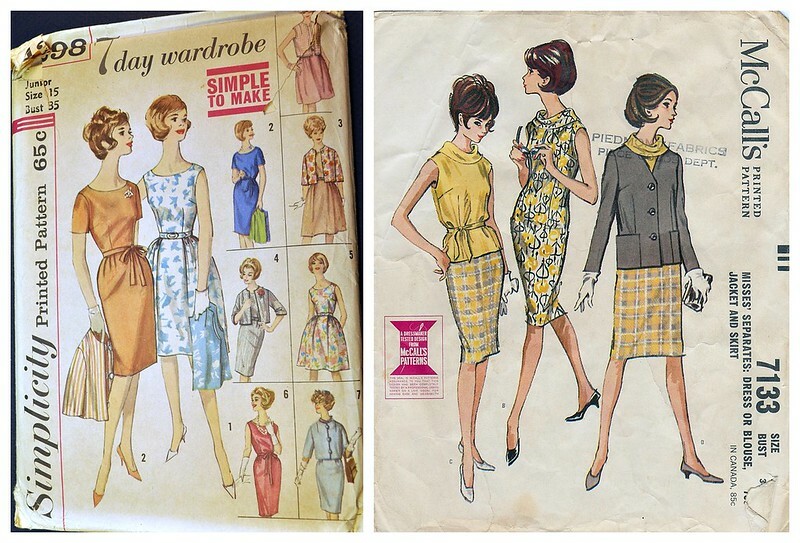 You can even sew up your own entire weekly wardrobe from a single pattern set that often included a skirt, dress, top and jacket combinations. Multiple that by the various fabrics you can use and you're going to be a very stylish woman on a budget. These were the times when department store fashions were often a real investment (you sometimes paid off a dress in installments for goodness sake) so a 65cent pattern would have been a very economical everyday option. With all said and done (now that we've composed ourselves after drooling over these patterns), here's a rough outline of my Vintage Wardrobe Project. 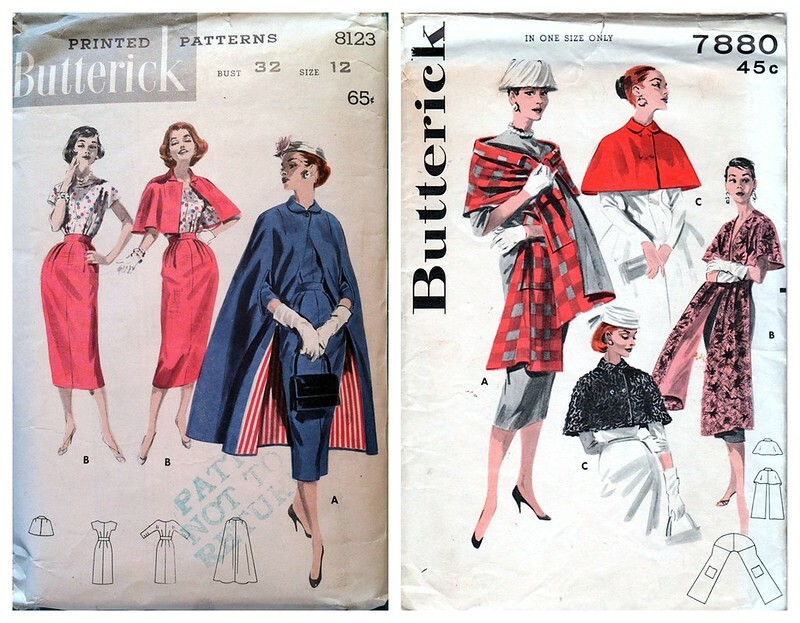 I've already purchase 3 patterns that are on their way and with uncut pieces being hard to find, this may have to become a "sew as we go" adventure. This may also call for another trip to the fabric store as well. Let me know what you'd be interested in seeing in this project! I'd love to see what you come up with! 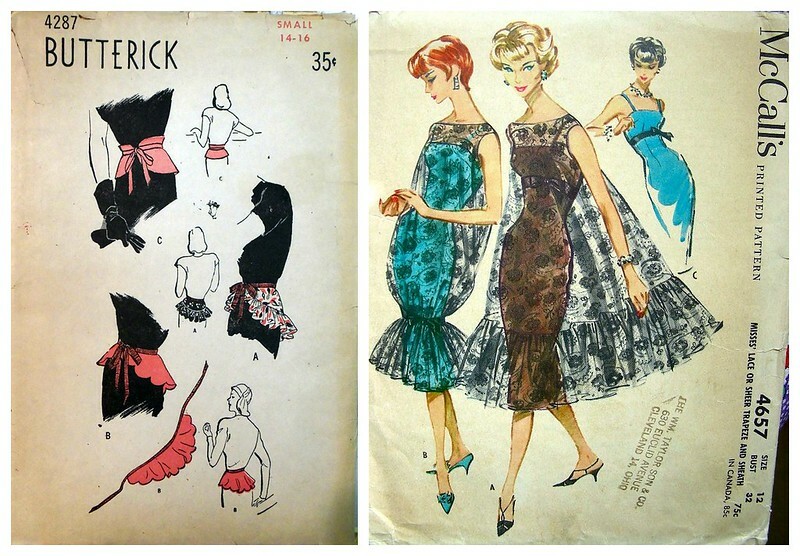 I'm always curious as to how vintage patterns are modernized. As much as I love the idea of vintage, I feel it often looks out of place in today's busy metropolises! While sewing is something I avoid, like even taking something outside to be altered let alone work at myself, I do like the clothes of the period. My solution, watching the first couple of seasons of the TV series Mad Men. They are like your outfit patterns come to life. Looking forward to when you finish off this admirable project.